At Chivas Brothers, the Master Blender's art lies in his skilful selection of malt and grain whiskies in the Chivas Regal blend. Of these, malts from Speyside are at the heart of the famous rich, mellow taste. Enjoy the great taste of Chivas Regal, blended for a refined smoothness. Anyone know if this tastes good? Don't confuse this with the cheaper blended whiskies, this is of a much higher quality. I bought this for £14 a week back from Asda. All £14 spirits seem to have been increased to £16 - £18 now, when I went there again yesterday. Even though it's 40% the equliavent sized JD required an empty stomach and a full bottle to get the same results. 21 units in 3 hours ? Great thanks just what I was looking for. 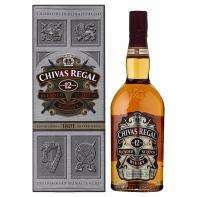 Chivas Regal is beautiful stuff, recommended for any scotch drinker! Its a nice whisky, the best whisky for making a hot half! Did you try it as a hot whisky John? Its the best hot half ive yet to try.